Swindon boss Mark Cooper says his side must not "play to the occasion" when they face promotion and local rivals Bristol City at Ashton Gate on Tuesday. Fourth-placed Town beat the league leaders 1-0 in November, bringing to an end City's 22-game unbeaten run. City captain Wade Elliott was sent off after only two minutes of the game, and tempers flared at the final whistle. "I'll tell them to play the game, not the occasion, and to not worry about anything around them," said Cooper. 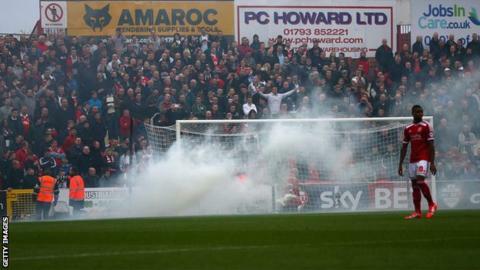 The former Bristol City youth player told BBC Sport: "We can only affect what goes on on the field of play. "We're playing against the best team in the league, with the best players and the best manager. They deserve to be where they are. "But hopefully on the night we'll show what we're about." Cooper came through the academy system at Ashton Gate, while his father Terry was first-team manager, but did not make an appearance for the Robins. "I love going back there, I love it," said the 46-year-old. "I grew up there because my dad was there. I've got really fond memories. "But now I'm manager of Swindon and I'll be desperate to get three points." Town were top of the league during the Christmas period but Friday's 3-0 defeat by MK Dons left them 15 points behind Bristol City, albeit with two games in hand. But Cooper, who takes charge of his 99th game as Swindon boss on Tuesday, said he still feels proud of his team despite them relinquishing top spot. "To be where we are is a tremendous achievement with such a young and inexperienced team. They've been incredible," he added. "Of course they're going to lose games because for some of them it's their first season in senior football. But they'll always bounce back with a run of wins after they've had a blip. "To be where we are is amazing and hopefully we can finish the season properly."